Last month, the IWRC was excited to attend the 2015 Minnesota Paint and Powder Coating Expo in White Bear Lake, MN. The event was hosted by the Twin Cities Chapter of Chemical Coaters Association International and the Minnesota Technical Assistance Program at the University of Minnesota. IWRC provided painter training on the first day of the event. Two four-hour sessions were held covering the fundamentals of spray application and focusing on best practices to optimize spray technique. On the second day of the event, IWRC was on-hand at the vendor show to hold a the Virtual Reality Spray Finishing Demonstration showcasing the VirtualPaint. 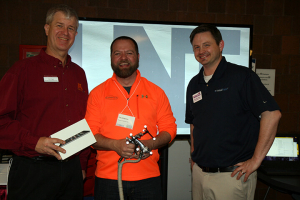 Throughout the demonstration, scores were tracked and we were pleased to award Toby Wiegman of Superior Industries Inc. (pictured to the right) as the winner for VirtualPaint spraying! You can check out Products Finishing for an article recapping the event as well - CCAI Twin Cities Expo Draw Large Crowd!